The Childcare Voucher scheme closed to new entrants on 4 October 2018. But that doesn’t mean our campaign stops here! Employers For Childcare has battled hard on behalf of working parents to keep the Childcare Voucher scheme open to new entrants. The #SaveChildcareVouchers campaign rallied tens of thousands of parents, employers and childcare providers to make their voices heard. We have submitted robust evidence to Government – included a detailed Budget Submission – setting out why Childcare Vouchers should be kept open and evidence of how working parents will be disadvantaged because of its closure. By closing the scheme to new entrants, the Government has disregarded this widespread public support and the clear evidence which has been presented to support keeping the Scheme open. Since Childcare Vouchers closed to new entrants, Employers For Childcare’s charity helpline has been inundated with calls from hundreds of angry and frustrated parents who will be losing out financially because they cannot access the Childcare Voucher scheme. Our mission is to represent working parents and ensure their voices are heard by Government and we will continue to do just that. The #SaveChildcareVouchers campaign has put childcare to the forefront of Government policy and that’s where we want it to stay but to do this we need you to Voice your Voucher story. Please tell us how the closure of Childcare Vouchers has negatively impacted your family. Example: Sean contacted us recently. A new parent with one child, he and his wife are both teachers. Sean missed the deadline to sign up for Childcare Vouchers, however his wife was able to sign up in time. The family are better off for one parent to be claiming Childcare Vouchers than to move to the new Tax-Free Childcare scheme, however because Sean was unable to join this means that they are losing out on additional savings each year. These are savings that could be put towards the cost of childcare now, and in the future. We will use your Voucher story and that of other parents, employers and childcare providers to collate evidence to bring to Westminster. This evidence will put additional pressure on the Government to review its decision to close the Scheme before the Budget is announced on 29 October 2018. Please note: all stories will be anonymously recorded and submitted with no personal information. We would like to thank all of the parents, employers, childcare providers, charities, support organisations, elected representatives and others who have given their support to the campaign to #SaveChildcareVouchers. This support is critical, and shows the breadth and strength of feeling behind the campaign. As well as sharing information on social media, others have written to MPs, or contacted HM Treasury directly. To read more about how the #SaveChildcareVouchers campaign developed click here. What has the #SaveChildcareVouchers campaign achieved? In March, the campaign achieved a 6-month extension to the Childcare Voucher scheme, originally set to close in April 2018. A Treasury Committee Inquiry to which we gave evidence reported in March 2018 recommending Childcare Vouchers be kept open until the ‘winners and losers’ of closing the scheme are fully understood. We have built positive working relationships with MPs and key influencers and secured a meeting with HM Treasury at a senior level, which took place in August 2018. In addition, our nationwide campaign has built a strong network of parents, employers and childcare providers across the UK. 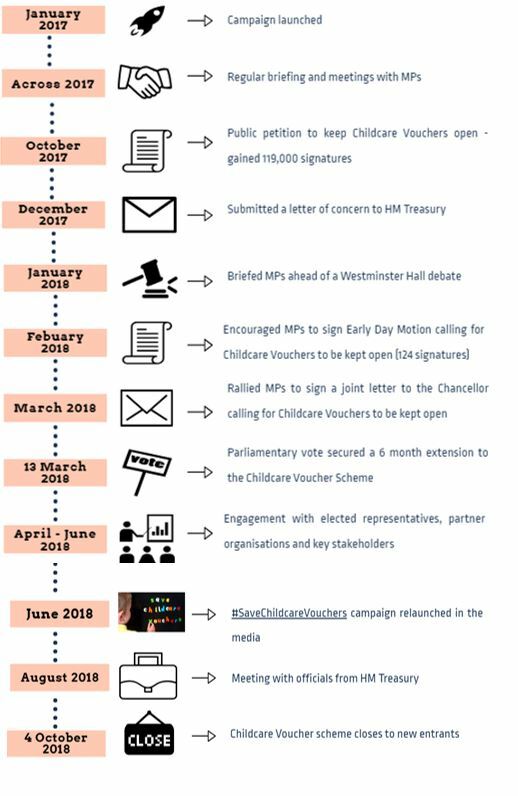 We have helped to secure signatures from 124 MPs from all opposition parties (January 2018) and, more recently, 69 MPs (July 2018) for Early Day Motions calling on Government to keep Childcare Vouchers open. In June 2018 we further developed the online campaign with a new #SaveChildcareVouchers hashtag used to rally support through social media. There has been a successful employer pledge – 272 employers across the UK, representing 141,000+ employees have signed up to stand together and call on the Government to keep the scheme open. We are now embarking on the next phase of the campaign, asking parents, employers and childcare providers to Voice their Voucher story so we can keep up the pressure on Government to re-open the Childcare Voucher scheme to new entrants! Check out the campaign timeline above to read about our lobbying efforts and the impact of the campaign to date.